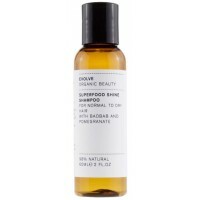 Evolve Organic Beauty Superfood Shine Conditioner (60ml) is a shine-boosting conditioner that leaves hair feeling soft and weightless with a high level of shine. This conditioner is enriched with natural oils and butters including organic shea butter to replenish and rehydrate normal to dry hair. The incredible Baobab proteins have been shown to boost shine, strengthen, protect, reduce frizz and tangles as well as boosting softness and smoothness for greater hair manageability. 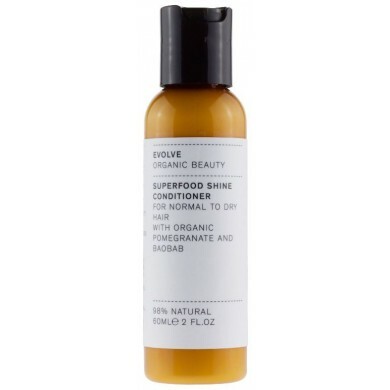 Organic pomegranate extract rehydrates and protects hair whilst organic aloe vera soothes.